Hey, Everyone! It's Deanna from A Primary Owl. Are you still in summer mode or busy getting ready to go back to school? Well, I only have one more week then we have preplanning! I am soooooo sad, summer goes by so fast! It was a great summer though. 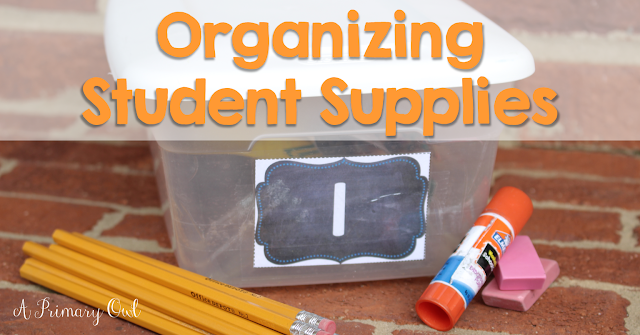 So today I thought I would share one of my tips for organizing student supplies. I am lucky in that the parents of my students buy all their school supplies. (even more than we ask for!) So at "Meet the Teacher" they come in with a ton of supplies and I am in this huge predicament of where to put it all. My students cannot possibly store all their extra stuff in their desks....but I want to save their extra glue sticks, pencils etc. for them and not put them out as community supplies. I feel parents really appreciate the fact that the supplies they purchase are being used for their own child. I purchased these plastic shoe boxes from the Dollar Store and put one on each student's desk at Meet the Teacher. 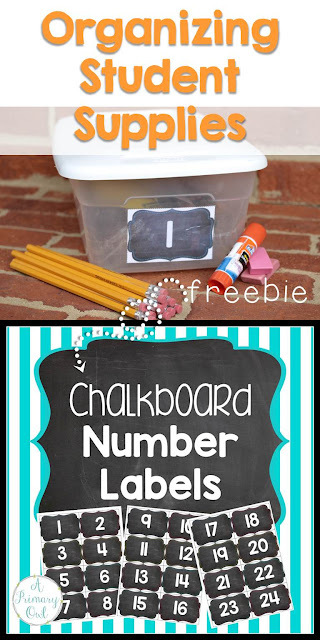 Then any extra supplies that can't fit in their pencil boxes can be stored in there. I have a cabinet I keep all the shoe boxes in. As the year goes on, when a student needs pencils, crayons or glue sticks, I hand them out. It helps ration out things and usually we even end up having supplies last until the end of the year!! Occasionally I have friends who run out of glue sticks (of course...) but I always have someone willing to donate one from their box. This system has worked wonders for me! If you've got a lot of stationary at home, you're definitely going to need some good storage solutions! Heaven forbid all the colour pencils and crayons go on the loose! จีคลับ Online casino gambling entertainment sites will make gambling easier. It can be played as you would play at. All bets are good bets. Gambling can be played anywhere. This is a gambler. Have fun every day. Gambling is the number one game that anyone would like to gamble easily that you like. Choose the bet you want to bet on every day. The first bet is to have fun all the time. There is a realistic gameplay.